Select Dealership from #4 and click this button to view menu usage logging. Click this button to merge products, exclude products, edit deal logs, and manage goals for reports for a specific dealership. Select the type of report you would like to run. Non-DMS and DMS cannot be run together. You may ONLY run reports for dealerships of the same type. Select the Report criteria you wish to run by selecting from the dropdowns. Click this button to display a report based upon the search criteria selected. Select "DMS" under Integration. Report options will refresh to load ALL enhanced DMS reporting options. Click this button to display/hide the advanced options for filtering reports. Select a Template from the 'Select Template' drop down. Once your template is selected, you may change your report criteria as you wish. When your report criteria has been changed to your satisfaction, click 'Actions' and select 'Update Saved Template' from the drop down menu. An "Update Template" modal will appear to verify your edits. Click 'Update' and your template will be updated to the new criteria. Have a Template saved for a Finance Manager with extensive criteria and you do not want to recreate it all over again? No problem! Select the template from the 'Select Template' drop down menu. Select and change the criteria you wish to change. Click 'Actions' and select 'Save as New Template'. The "Save Template" modal will appear and allow you to save the template under a new name and keep your existing template. Select the template from the 'Select Template' drop down menu. Once the template is selected, click 'Actions' and select 'Delete Saved Template'. The "Delete Template" modal will appear to confirm the delete criteria is correct. Click 'Delete" and the template will be removed from your list of templates. Select a Template from the 'Select Template' drop down menu. Once the template is selected, click 'Actions' and select 'Schedule Report'. The "Schedule Report Subscription" modal will display. 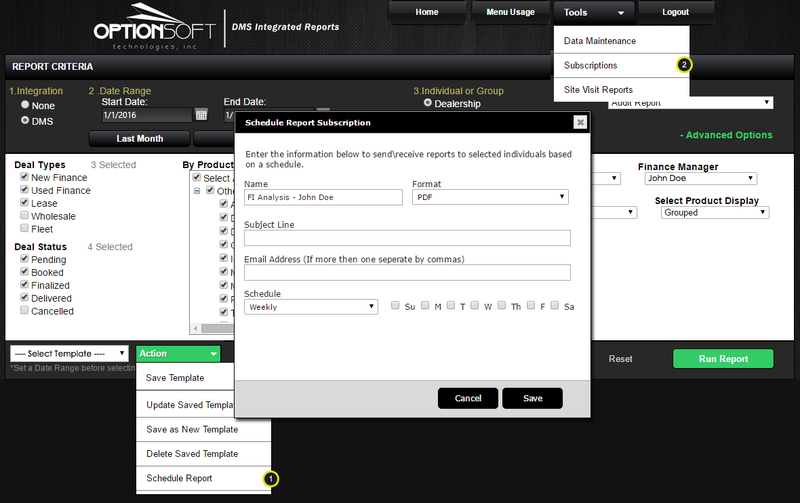 Select the format, enter a subject and email address(es) to send, and select the schedule to receive the reports. When you click Save, your subscription will be saved and the emails entered will receive these reports(by email) based on the schedule set. Click 'Tools' from the top header and select 'Subscriptions'. The "Report Subscriptions" modal will appear and allow you to view and edit all saved subscriptions. Under "Actions" you can click the 'Edit' icon to change any criteria set for a subscription. You can click the 'Email' icon to force send a subscription at any point in time. To remove a subscription, click the 'Delete' icon. A "Delete Subscription" modal will appear to confirm the delete criteria is correct. Click 'Delete' and the subscription will be removed from your list of templates.